Assessment is the ongoing process we use to find out what every child knows and can do. It helps us discover each child’s strengths, skills, interests, and needs so we know how to help every child experience success. Our assessment system also enables us to exchange information with families so, together, we can ensure that your child is progressing. The assessment system we use does not involve testing children. We learn about children by carefully observing what they do and say as they participate in everyday activities in the classroom. We know that each child is an individual, with different interests, skills, strengths, and needs. The more we learn about each child, the better we can plan experiences that are just right: sufficiently challenging and engaging. What Is Being Assessed and Why? When assessing children, we observe and nurture the skills and knowledge we want them to acquire in our program. Assessment, therefore, is closely linked to our curriculum. To teach effectively, we have to know what to teach, when to teach particular skills, and how to teach in ways that help each individual child develop and learn. What we teach is guided by 38 objectives that address all aspects of children’s development and learning. The experiences and learning activities we plan each day are designed to help children acquire these abilities. You will no doubt find that the objectives for development and learning are ones that are also important to you. You have watched your child growing and learning since birth. The 38 objectives for development and learning are based on research, include the skills and knowledge that predict children’s school success, and are aligned to state early learning standards. This reassures us—and you—that we are focusing on the most important skills and knowledge that children need to acquire in the first 5 years of life. The objectives are organized into 10 areas of development and learning, including 2 for English- and dual-language learners. Many of the objectives are broken down into 2 or more smaller objectives called “dimensions.” These dimensions clarify all the skills that are relevant to each objective. Below, you will find a link to the complete list of all the objectives for development and learning for children from birth through kindergarten. 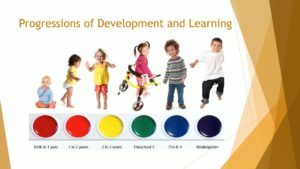 what we learn about each child’s abilities.Teaching Strategies GOLD® uses a color-coded system to show the widely held expectations for children from birth through kindergarten. The color bands are based on widely held expectations and cover a range of skills within each objective. to be at for each age group or class/grade. The example that follows shows the steps (progressions) for one objective under cognitive development: “Uses classification skills.” Under each step, there are examples of what a child might do or say. These examples help us know what to look for when deciding what step a child has reached. Play sorting games with familiar objects, such as sorting different colored blocks or organizing a collection of buttons or bottle caps. Sort a collection of objects into categories according to two characteristics and have children guess how we decided to group the objects. Then have children sort the objects, so we have to guess the children’s categories.Because the experiences we plan for children depend on what they already know and what they are ready to learn, ongoing assessment plays an important role in our program. use the information to plan experiences that support your child’s learning and meet individual needs, both at home and at school. We regularly review the information we have collected in each child’s portfolio to determine what step a child has reached in the progression for each objective. We know what reasonable expectations are for each objective and dimension, and where most children of a particular age-group or class/grade are likely to be at the beginning or end of a program year. Is the child making progress? Is the child performing within widely held expectations? If not, why?There might be several reasons a child is behind what is expected. It could be that the child has not had sufficient experiences to develop the skill or understanding. In that case, we know we have to give more attention to providing the support the child needs. It may also indicate that a more in-depth assessment may be necessary to identify what is preventing the child from progressing. The last step in the assessment process is summarizing what we have learned about each child’s progress on all the objectives, and then using the information to plan for each child and for the group of children. Because Teaching Strategies GOLD® online covers all areas of development and learning, we have a complete picture of every child. We know where a child’s development and learning is progressing as expected, and what areas need more focus and attention. We will share a “Development and Learning Report” with you online that summarizes what your child’s knowledge and skills currently are, and where you can expect your child to go next. The activities we offer children each day can be adapted based on what we know of each child’s abilities. We can modify any activity to make it simpler or more complex so all children can participate successfully. This is the great value of our assessment system. It not only connects to our curriculum, it also offers families access to many easy-to-use activities at home that are designed to address each child’s level of development and learning. If there are activities that we think are just right for you to use with your child at home, we will share them with you online. 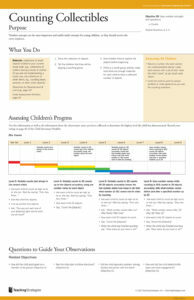 Lastly, please review our Using Teaching Strategies Guide to learn more about creating and using your family account. If you have any questions about Teaching Strategies GOLD, please feel free to speak with someone in the main office at your location.